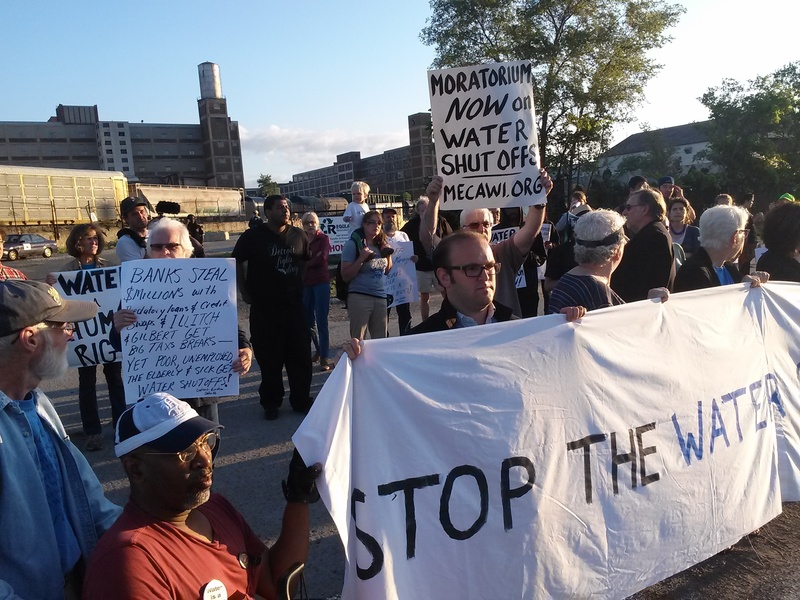 Detroit activists concerned about the massive water shutoffs across the economically devastated city blocked entrances into the yard of Homrich, a firm given a nearly $6million contract to terminate services for hundreds of thousands of people. The firm was hired by emergency manager Kevyn Orr who was appointed by right-wing Gov. Rick Snyder in March 2013 who later forced the city into the largest municipal bankruptcy in United States history a year ago. A picket line set up before 7:00 a.m. on July 10 blocked the entrance to Homrich for over an hour. Eventually police arrived and attempted to force demonstrators out of the driveway prompting resistance leading to ten arrests. Protesters were taken into custody and charged with disturbing the peace. A hearing has set for July 21. Rev. Bill Wylie-Kellerman of St. Peter’s Episcopal Church in Detroit said that he would gladly get arrested again in order to further the cause of stopping the shut-offs. Also arrested was Elena Herrada, a member of the Detroit Board of Education in exile and a candidate for Michigan state representative. The actions are part of a citywide efforts to declare a moratorium on water shut-offs. The ninth week of Freedom Friday protests are scheduled for July 11. On July 15 hundreds will gather outside the federal courthouse in conjunction with a bankruptcy hearing where at least 60 people will present legal objections to the so-called “plan of adjustment”. The plan, if approved, would implement huge cuts in retirees’ pensions and further disempower and expropriate Detroit residents of city assets and municipal governance rights. Already Belle Isle, the Detroit Public Lighting, Detroit Public Works, Human Services and the city health department have been taken over and privatized. Tens of thousands of retirees have had their healthcare programs cancelled and are also facing substantial cuts to pension benefits. There is currently an effort to privatize the management of the Detroit Water and Sewerage Department (DWSD). The water department was struck hard when $530 million was taken out of the system in 2012 to terminate yet another fraudulent interest-rate swap deal controlled by JPMorgan Chase, Morgan Stanley and other banks. The July 18 Freedom Friday will be held in conjunction with the Net Roots Nation conference taking place in Detroit where thousands attending the event are being encouraged to come out into the streets and join protests against emergency management, the banks and forced privatization of the city.